Newspapers are amazing!!! 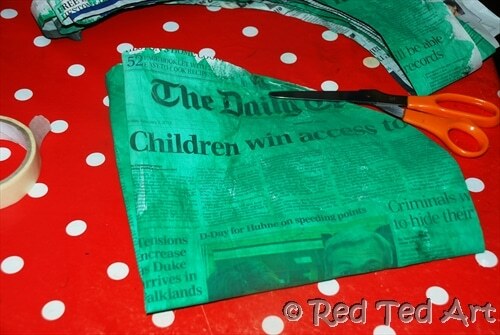 You can turn newspapers into so many different Newspaper DIY Ideas – thrifty, fun and environmentally friendly. 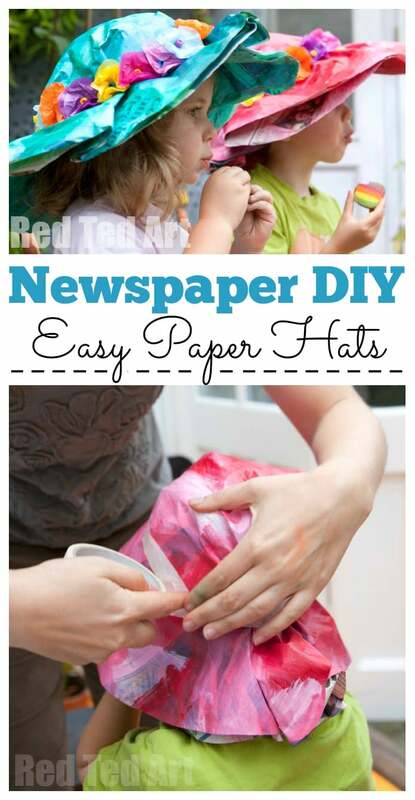 Today, I want to show you how to make a newspaper hat for kids. It is super quick and easy to do and is perfect as part of a more elaborate costume idea (wouldn’t it be a great granny hat) or as an Easter Bonnet DIY (in fact, we first made these with Easter Bonnets in mind). 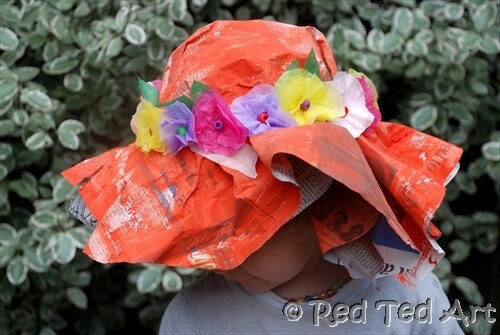 We have also made this quick paper hat our of brown packing paper before – to turn it into a more safari hat! 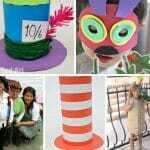 One hat.. so many ways to use and decorate! It does however make a great Easter Craft with Newspapers! 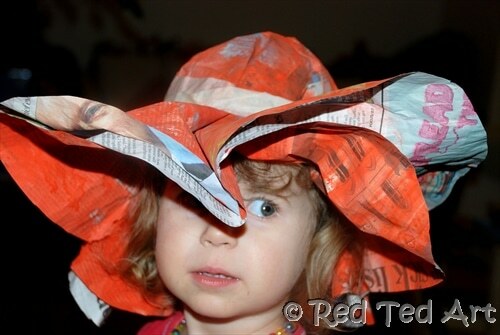 How to make a Newspaper Hat for Kids! 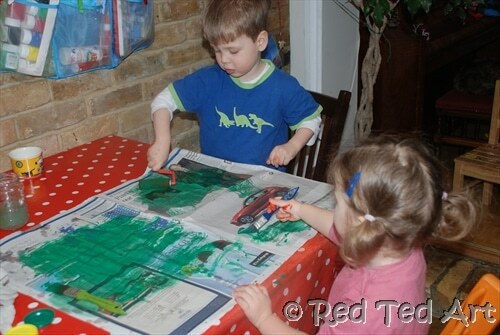 1) Paint two sheets of news paper in your desired colour. 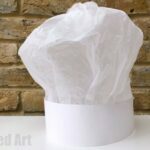 We did two sheets to give the hat more body and also, so that you get colour on both sides… however, should your hat get wet, you may end up with a red rim around you head.. I am not sure! So really.. you can paint just the one sheet if you wish! Our sheet paint was “team work”, as we don’t have enough space to do all at once. But it was lovely to paint together. 2) Once dry, cut out a circle. The easiest way, was to fold the paper twice and cut out a quarter. 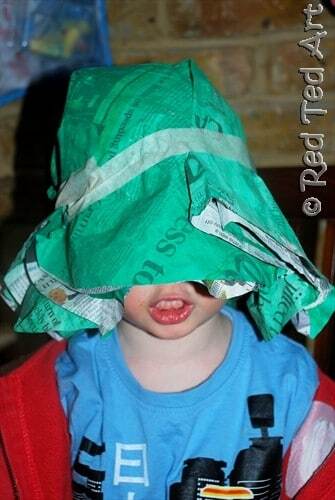 3) Place the paper on top the child’s head, fold down and tape round with masking tape. Then fold up the sides. You may want to practice with some “non painted” newspaper first and save the coloured paper for last. HAT DONE! And you can use this hat for any situation! 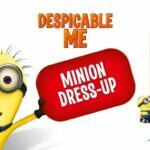 Doesn’t need to be for Easter Bonnets, could be for a fancy dress party or “just because”. 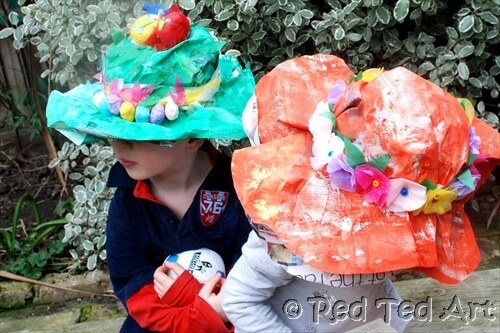 1) We made some flowers – I thought that an Easter Bonnet should have Spring flowers. 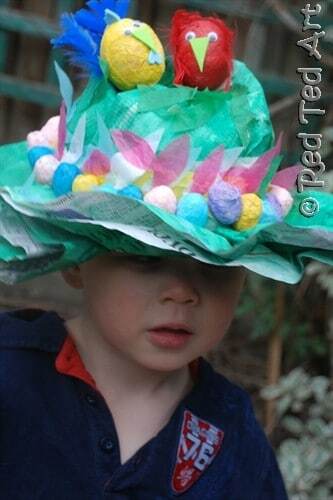 We ended up using them all on Pip Squeak’s hat, as Red Ted only wanted leaves and eggs! But that is fine by me. 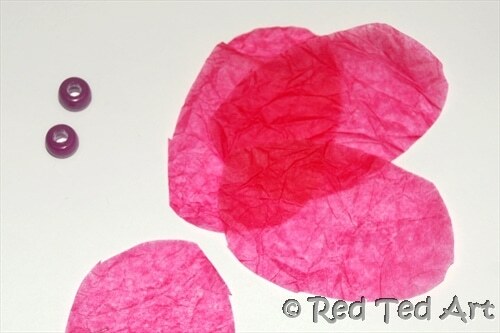 To make the Spring flowers, we used 4 sheets of oval tissue paper and a bead. And just stuck them all together with PVA. You don’t need much glue to get the tissue paper to stick. We used oval paper, so that they over lap a little like petals. Once stuck, we scrunched them up a bit. 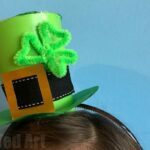 Cut some leaves and add to your hat! 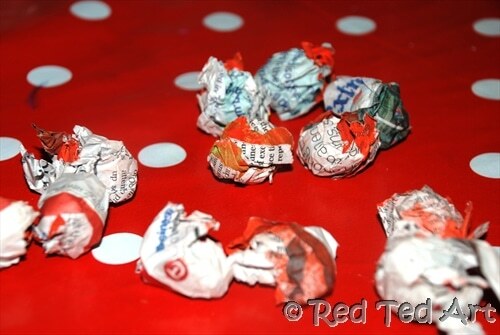 2) Mini Easter Eggs – as mentioned Red Ted wanted lots of eggs on his. He started sticking on lots of leaves too. I rather liked his idea – as it made his head look a bit like a nest! Cute! To make the mini Easter eggs, we scrunched up newspaper in a mini egg shape. Added glue to your tissue paper and wrapped it around. Then we let them dry. 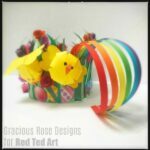 3) Here is Red Ted’s “nest” including our Rooster & Hen Easter Eggs. Done. 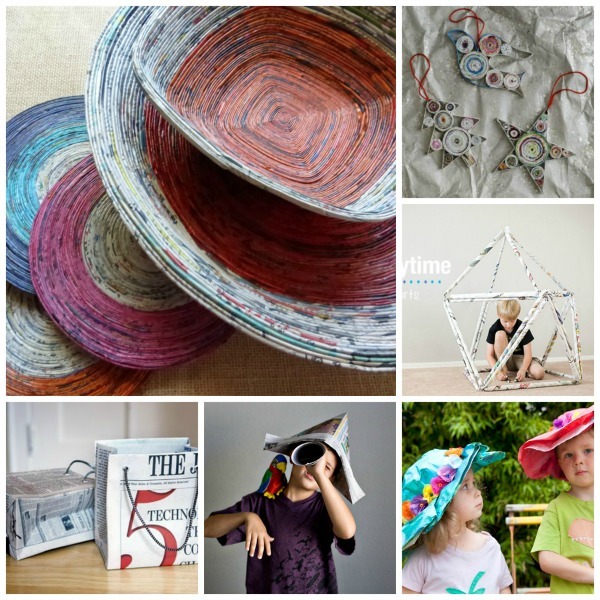 You have your newspaper hats finished. I love the Chick & Egg versions, as well as the flower versions. 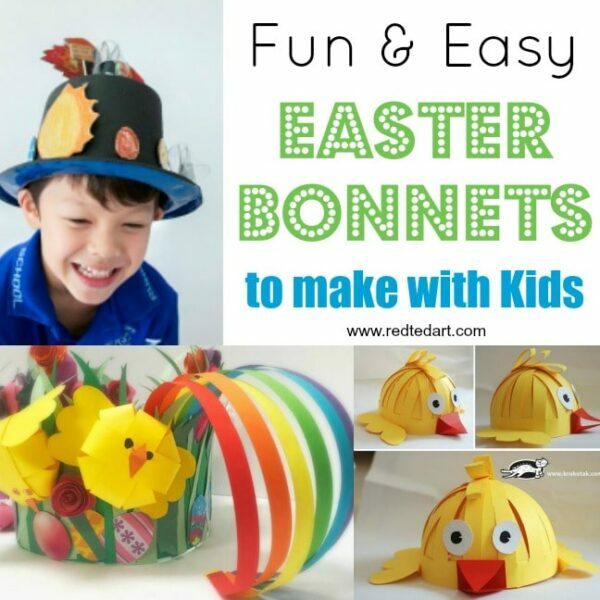 They make great Easter Bonnets, don’t you think? Enjoy! 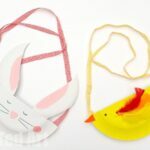 Find the rest of our Easter Bonnet DIYs for kids here!